Although not really new, the Internet of Things (IoT) is one of the “trendy” technology topics right now. It was the selected subject for a panel discussion at the 2015 InfoComm opening keynote in June. Earlier in the year, USA Today named it one of the “Top Five Themes at CES2015,” and my guess would be that it will be mentioned at least once during the CEDIA EXPO 2015 keynote in October. So why the recent buzz? 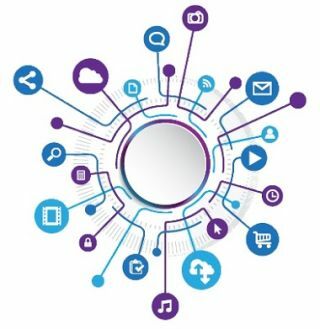 If you look at recent reports from business consultancy, market research, and analyst firms, the forecasted numbers for internet connected objects is quite impressive. It is estimated that today there are somewhere between six and 14 billion communication connected “things” (not including laptops, PCs, and smartphones). The International Data Corporation (IDC) estimates 32 billion connected objects by 2020, and Gartner is forecasting 33 billion. On the financial side, Gartner estimates incremental revenue to exceed $300 billion in 2020 from IoT product and service suppliers; GE believes that “Industrial Internet” has the potential to add $10 to $15 trillion to the global economy over the next 20 years. There is no doubt that the Internet of Things has kept analyst firms and technology journalists busy over the past year, but whether it’s 32 or 33 billion connected devices, there is no doubt that many opportunities will be created by the extraordinary flow of data. Although our industry has been using sensors and networks to collect information and control devices for a long time, a variety of converging factors are accelerating the interest in IoT. First is the diminishing size and cost of sensors. We are also seeing the broad availability of wireless network connectivity and analytic software is getting easier and smarter. And finally, we continue to see declining costs and increased flexibility of cloud storage. Although the opportunities will be plentiful, there are still challenges to overcome. With billions of new devices on the network, security is one of the top challenges. The good news is a host of recognizable names are already focused on IoT and are offering security solutions to prevent and detect unintended or malicious activity. Standardization of communications protocols is another key challenge, and although the ITU is working on a global standard, it will probably remain an ongoing issue. Powering the sensors for the long-term is also a critical issue, as is the development of sensors for a wide variety of brand new applications. But one of the biggest challenges is the protection of data and privacy concerns. As sensors become more commonplace, so will the ability to track user movements, habits, and individual preferences. Personal privacy and the protection of that information could become the largest roadblock for IoT. But I see the big question as, ‘How do we make it relevant to the AV industry?’ If we think about the applications of IoT, we can break it down into two high-level categories: data and analysis, and automation and control. IoT links data from products, people, and the environment, providing instantaneous information for improved decision making. Automation and control closes the loop from data and analysis to initiate actions that modify processes and drive results. Common examples referenced in IoT discussions include building and home automation, manufacturing optimization, smart cities, and healthcare. Applications are focused on reducing TCO, improved productivity and simplified resource management through energy optimization, inventory and asset tracking, improved traffic control, and remote monitoring. Relating this to AV, some simple examples of data and analysis applications in the enterprise would be monitoring the number of participants in every corporate meeting room for a period of time, while comparing the data with room size and seating configurations to provide guidance to improve real estate utilization; monitoring the technologies utilized within a meeting room to determine resource requirements for future rooms, as well as linking room utilization to technology availability; monitoring smartphones via Bluetooth and Wi-Fi to determine wait times in airport security, amusement park, or other types of queues and displaying it on digital signage. As the quantity of “things” increases and becomes more intelligent, there is an opportunity for a fundamental shift in the creation of new AV products, and more importantly, services. Consider how the continuous monitoring of product-utilization patterns could influence the future design of new products (hardware and software) and accelerate the adoption of new technologies. Or consider how the IoT could affect product revenue when the data management and related services become more valuable than the hardware itself. I am not saying “products” will disappear, but this reinforces the need to have a long-term services strategy. The IoT will be a transformational shift that is difficult to fully comprehend today. The key is to learn as much about it as you can and become aware of significant impacts that it may have on your business. During your IoT educational journey you will discover a variety of tools and applications for collection, analytics, and display/interaction of the data. The collection is typically done by software running in a data center. It is responsible for receiving and organizing the data, as well as managing the sensors. The analytics engine then receives the organized data and processes it, and the display/interaction application presents the information via a mobile or web app or via an enterprise application to the enduser. Some development tools only address certain aspects of a solution, such as connectivity of hardware or firmware development tools. Many platforms combine the analytics and display/interaction components and a few provide a totally integrated and secure platform for collection, analytics, and display/interaction. Some of the more recognizable enterprise names with IoT development platforms include: HP, Oracle, SAP, Microsoft, IBM, and Intel (gateway development kits only). Some of the smaller development platform suppliers include Muba, Buglabs, Etherios, Thinkworx, and many more. Key features to be aware of are speed of deployment, flexibility, and scalability. The development tools may be open source or available as PaaS, leased, or licensed solutions. Many have integration capabilities to existing CRM and ERP systems and some have a specific vertical application focus (home automation). Other key feature offerings include sensor templates and libraries, power management frameworks, and support for a variety of wireless connectivity types (GSM, 3G, 4G, and satellite). The Internet of Things has the potential to create a huge disruption, as well as deliver huge opportunities over the next few years. Make sure you have a strategy to participate in the huge opportunities instead of being caught in the disruption.